Sturtevant, Wisc. 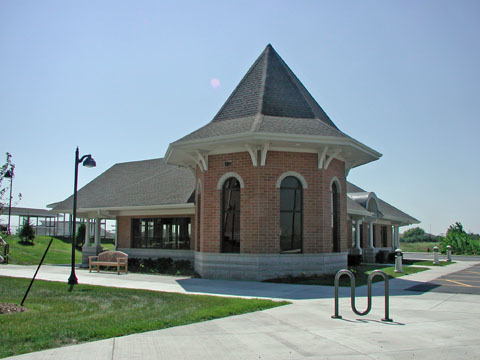 Amtrak station offers entry fee parking for Amtrak Hiawatha passengers; pay at automated pay station/gate with currency or credit card. Located south of State Hwy 20. Exit from Hwy 20 west of track overpass, at traffic lights for Renaisance Business Park, County Hwy H. Click here to scroll down for a map. The former Sturtevant station was erected in 1907 (or earlier, according to some local historians) by Chicago, Milwaukee, St. Paul & Pacific RR at intersecton of its Southwest subdivision (the RSW) and Chicago & Milwaukee subdivision (C&M), busiest of them all. By mid-1990s, its former importance dwindled to mere shelter for passengers on trains pausing for fares paid to Amtrak, which paid owner Soo Line and its CP Rail parent a pittance for use of the station. For sheltering about 5 percent of riders in the Milwaukee-Chicago Hiawatha Service corridor. A bright 1999 summer day found it gleaming white beyond a parking lot full of about 60 cars, its threatened demolition stalled by local interest in its preservation. 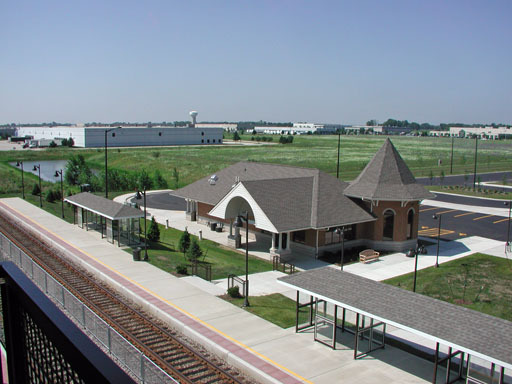 Months earlier, Governor Tommy Thompson pledged during an August, 1998 visit with other key state officials to southeastern Wisconsin that a new station for Sturtevant was important for the village, for the surrounding area and for Amtrak. He spoke with authority, as both governor and Amtrak board chairman. Once bids were accepted and contracts awarded, work began and moved ahead swiftly. The cul de sac is gone and trucks now roll easily from asphalt onto the gravel and dirt path carved for them. To the north, a mound of top soil has risen near STH 20, and work will continue as the prospect of frost, then frozen ground urges foremen and the project superintendent to stay at it in order to meet the August, 2006 predicted date for completion. 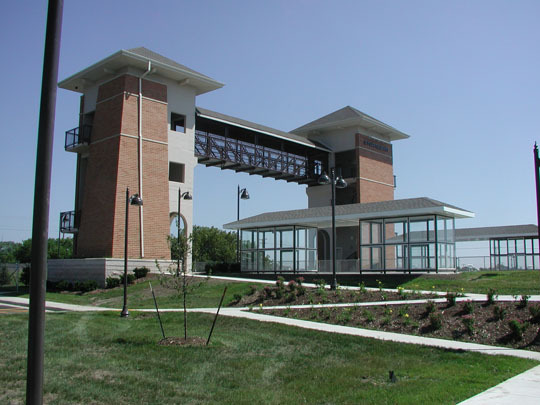 Nine months after the prairie grass was bladed away and grading begun, the brick station and its pair of towers with pedestrian bridge spanning both main tracks stand prominently near State Highway 20 (Washington Ave.), one mile (1.6 km) north of downtown Sturtevant and the present Amtrak station. 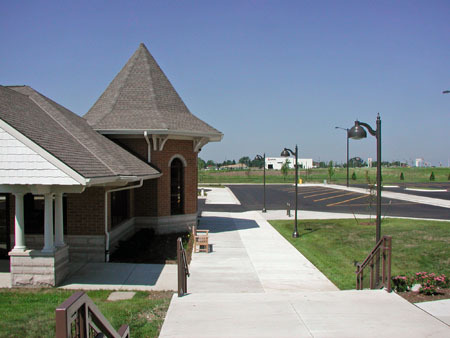 Two drop-off/pick-up areas adjoin the station building, plus plentiful parking for vehicles of day-trippers to Milwakee and Chicago. At mid-June the new station for Amtrak Hiawatha riders (but not Empire Builder, which does not stop at Sturtevant) has taken full form, with a station architecturally reminiscient of the present station one mile south, and a pair of trackside towers with stairs and elevators for pedestrians to cross the CP Rail tracks. Preserving the architectural highlight of the 20th century depot, built one mile south at the height of ambition for traffic growth in about 1907, this incarnation of Sturevant's train station a century later also exemplifies the openness of the era and the people of Sturtevant, its more numerous windows brightening the interior. Practical improvements abound also, such as parking space increased almost threefold. Better views of the platform through the several windows also afford waiting passengers last-second discovery that their train has arrived for boarding, although sterling on-time Hiawatha operation suggests readiness to board should be uppermost. 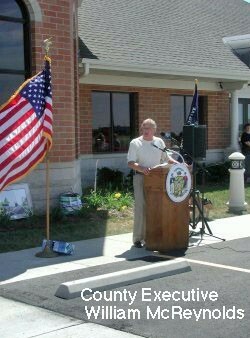 Dedication of the new Sturtevant station, now in use, drew more than 200 enthused village residents and Amtrak Hiawatha railfans to hear speakers praise the beauty of the new facilities, the role it will take in advancing economic development and jobs, and ambitions for more train service in Wisconsin. Amtrak Gen. Supt. 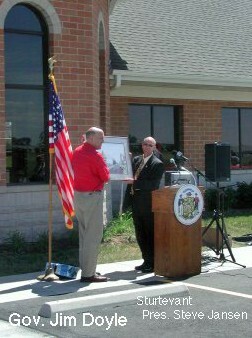 Saunders noted co-operation among CP Rail, WisDOT and his passenger railroad gained a strengthened local partner at this new location. 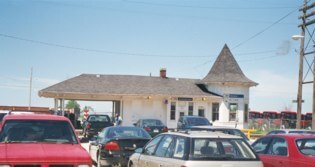 The former station and its parking closed to the public at 6:00 a.m. on Monday, August 14, 2006 and its future remains uncertain as CP Rail awaits local funds to move it, although no funding has been forthcoming. 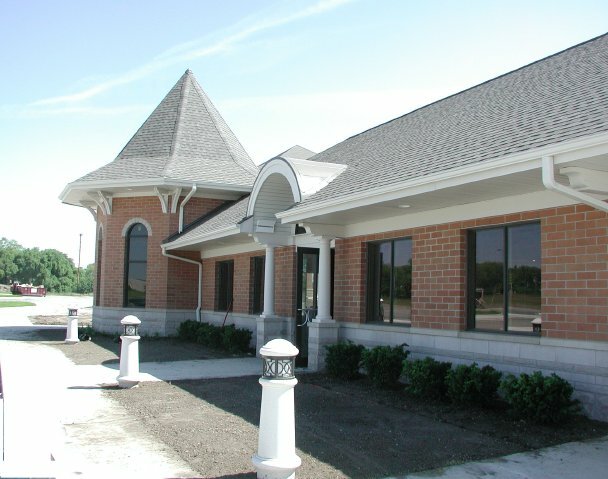 Nov. 2009 update: Historic station moved to Linwwod Park, village of Caledonia, east of Hwy 38 on Five Mile Road. One hour from its Chicago destination on August 23, this Empire Builder and its Amtrak business car proceed slowly here, for track work in progress one mile north of Sturtevant in the vicinity planned for the new Sturtevant station. This Empire Builder and its opposite arriving August 23, 2005 in Portland and Seattle after traversing 2,200 miles officially inaugurated upgraded onboard services and interior appointments, improvements which a back-to-basics Amtrak management team seems to expect will sustain first-class ridership to the benefit of the entire range of services on which so many depend in sparsely populated states along its middle miles. 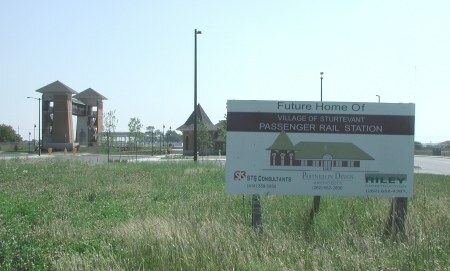 No stop for Empire Builder at Sturtevant is planned, even after completion of the new station. (Click on photo above for link to La Crosse Tribune interview with David. L. Gunn. 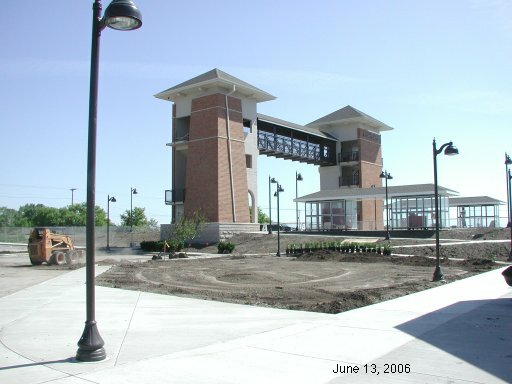 Fifty weeks after Mister Gunn passed by the location at CP Rail MP 63, a new station was complete and on August 12, 2006 dedicated for use to begin two days later on Monday, Aug. 14. 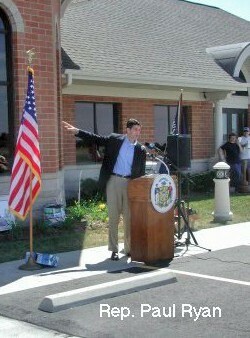 Click on image below for a video of the first train leaving the new station enroute to Milwaukee. Video created with QuickTime® in .mp4 format. Viewing with QuickTime player is recommended, and free download is available for Windows Vista and Mac OS X. This Hiawatha Service train #333 was first to make a stop for fare-paying passengers, though few availed themselves of the four stops made on August 12 by trains #333, #334, #335, and #336. Special effort by Wisconsin DOT Railroad Bureau and by Amtrak assured a smooth transfer of operation from the old location one mile away. 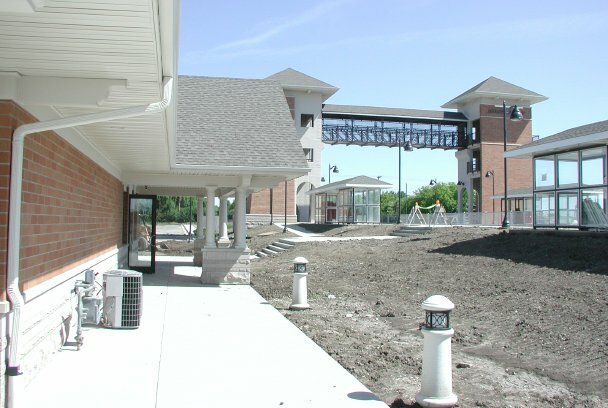 Added effort by them in arranging for dedication day access to the new station for Hiawatha riders is another indicator of the close co-operation which helps assure ongoing excellence for Hiawatha Service and its growing use. 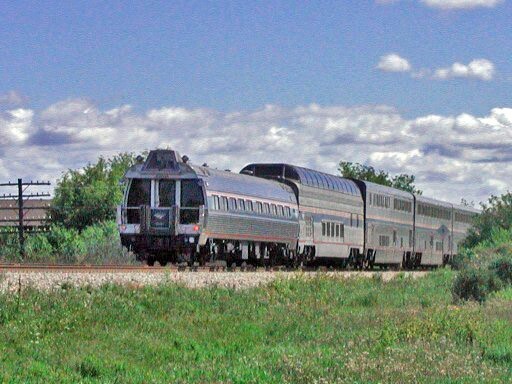 More than one-half millon passengers relied on Hiawatha Service in 2005 and 2006, more than 600,000 in 2007, and they surpassed 700 thousand in 2008.